Who: Hiding under the sunhat is Anna. I’m her mama, Holly. Her dad, Alan is the photographer and pack-mule, sporting a hiking backpack full of diapers. Where: Vieux Quebec. We were moving from east coast Canada to Ontario. We budgeted lots of time to make the drive with a 4 month old. Luckily we have a happy little traveler and arrived at our 1st hotel in Lévis, PQ ahead of schedule. We decided to take advantage of our location and take the ferry across to Quebec City. It’s a little piece of Europe in Canada filled with unique architecture, lots of shops and cafes and its own “castle,” the Chateau Frontenac. When: The evening of July 12, 2013. Why: As you can see from the photo, this fortified city was founded long before the days of accessibility. 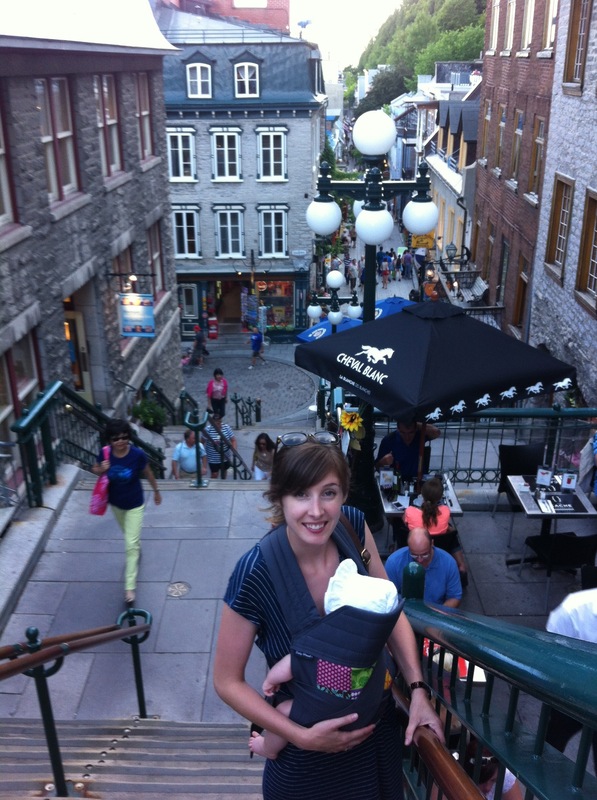 Full of staircases and steep cobblestone streets, it’s not exactly stroller friendly. We were so glad we choose to babywear for this outing when we saw other families struggling to navigate via stroller. We babywear so that Anna can participate in our adventures, whether they be just to the grocery store or hiking to a waterfall. I have to admit we love our stroller too. It’s great when you need to haul around a lot of stuff. Still, we are glad we grabbed our carrier as we headed out for this beautiful summer evening. It turned our move into a mini-vacation!